Curcumin is a substance found in the spice turmeric. 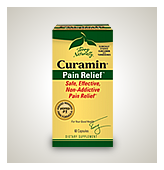 Curcumin is thought to have antioxidant properties, which means it may decrease swelling and inflammation. It is also being explored as a possible treatment for cancer, in part because inflammation appears to play a role in cancer. A study of 45 days of supplementation with curcumin showed marked decreases (60 percent ) in the level of serum lipid peroxide. It is suspected that the curcumin might therefore reduce the risk of heart disease, and other inflammatory conditions.42 It may also help asthma.43 A review of several studies suggests that curcumin has anti-inflammatory, antioxidant, anti-carcinogenic, anti-viral, and anti-infectious activities.44 A common dose would be 500 to 1,000 mg 3 times a day. Unfortunately, curcumin is poorly absorbed. Fortunately a new form that adds in the essential oils has been shown to increase absorption by 693%, dramatically increasing curcumin's effectiveness for a wide host of conditions including pain and Alzheimer's. Many studies are underway exploring curcumin's effectiveness for these conditions. When used in combination with boswellia, this highly absorbed curcumin has been shown to improve both osteoarthritis and rheumatoid arthritis more effectively than, medications and placebo in double-blind placebo-controlled studies. Turmeric/Curcumin contains at least 133 active compounds, and over 1,000 studies have been published on this remarkable herb. 42Ramirez-Bosca, A., et al. "Antioxidant curcuma extracts decrease the blood lipid peroxide levels of human subjects." Age, 18: 167-9, 1995. 43Arjun, R., et al. "Curcumin attenuates allergen induced airway hyper responsiveness in sensitized guinea pigs." Biol Pharm Bulletin, 26(7)1021 – 1024 (2003). 44Joe, B., et al. "Biological properties of curcumin-cellular and molecular mechanisms of action." Crit Rev Food Sci Nutr, 2004;44(2): 97 – 111.